Rewards on dining and more. With no annual fee, this card's greatest asset is the 3% cash back on your chosen category, as well as 2% cash back on dining (on the first $50,000 in combined purchases each calendar year, then 1%). 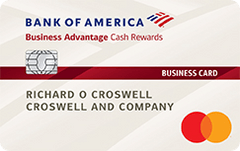 Our take: A good pick for business cardholders who are often on the road, the Business Advantage Cash Rewards Mastercard offers a generous cash back bonus on a category of your choice, as well as restaurant purchases.